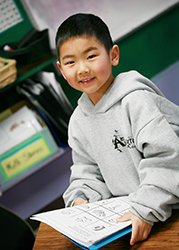 Individualized instruction and learning is one of the cornerstones of Rivendell School. It remains one of the defining reasons that parents, teachers, and students view Rivendell as an attractive option for preschool, kindergarten and elementary school in the Fort Collins area. At Rivendell, the curriculum is developed differently for each individual student with their unique personality, needs, academic levels and learning styles in mind. There is no one-size-fits-all approach, and accommodations for the special needs that students may have are built into our processes.